For more than 100 years, the United States military has endeavored to master not just the battlefields that we sail or trod upon, but the realms of air and space. As the U.S. Air Force approaches its 69th birthday as an independent service on Sept. 18, we take these few moments to reflect on where we began, and how Airmen of countless diverse backgrounds came together in times of peace and war to secure the nation’s freedom. The Air Force’s history and heritage is rooted in the creation of the Aeronautical Division of the U.S. Signal Corps on Aug. 1, 1907. It consisted of one officer, Capt. Charles deForest Chandler, and two enlisted men, Cpl. Edward Ward and Pfc. Joseph E. Barrett. The division’s initial aircraft consisted of kite balloons, before acquiring its first official airplane from the Wright Brothers in September 1908 at a cost of $25,000. From this period until World War I, the Aeronautical Division acquired more aircraft and individuals such as Benjamin Foulois, Henry Arnold, and Roy Kirtland who established an early tradition of innovation and experimentation that has become the hallmark of our service. World War I provided these aviators with the opportunity to test the limits of their daring in combat. The exploits of the Lafayette Escadrille, a volunteer flying unit under French command, provided the U.S. with an example of the capability of American pilots in air warfare. The official entry of the U.S. into the war coincided with the transformation of the Signal Corps’ air arm into a fully-fledged section conducting parallel air operations in training and combat actions, and requiring its own separate divisions in logistics, civil engineering, research and maintenance. On the battlefront, individuals such as Eddie Rickenbacker and Frank Luke became household names as they gained the status of combat aces. By the end of the war, although nominally under the command of the U.S. Army, the unique nature of its mission began providing the first glimpses of independence to come, as iconoclastic personalities such as Billy Mitchell and Carl Spaatz sought to establish airpower within the military’s pecking order. The period between the world wars brought with it further innovations and watershed achievements in the field of aviation, ranging from aerial refueling to helicopters to the first rocket launches. Improvements in aircraft design led to new records in flight endurance, highlighted by the spectacular cross-Atlantic voyages of Charles Lindbergh and Amelia Earhart. The Air Service itself was again redesignated as the U.S. Army Air Corps in 1926 and slowly grew to 15 groups and three wings by 1938. As the world once again fell into global conflict in the late 1930s, the efforts by Mitchell and others to solidify airpower’s military importance paid off with the endorsement of President Franklin Roosevelt to increase the number of aircraft in the Air Corps to 20,000 planes—a wildly optimistic number at the time, but one that proved prescient after the attack on Pearl Harbor officially brought the country into war and forever changed the course of the nation’s history. Industrial factories sprouted up overnight to produce a seemingly never-ending supply of fighters, bombers and transport planes, while bases across the country were established to train Airmen in every conceivable aspect of aircraft combat and mission support. The “all-in” effort required of the American population not only led to the successful victory in battle, but the increased roles played by women and minorities in enabling this victory, such as the Women’s Army Air Corps and the Tuskegee Airmen, planted the first seeds of the civil rights movements that grew and have flourished across the country in the ensuing decades. At the end of the war, the dropping of the atomic bomb on Hiroshima and Nagasaki forever cemented airpower as an equal component of U.S. military might. As the United States assumed its place as a global superpower during and after the war, so too did the role of the Air Corps transform, first into the Army Air Forces in 1941 and finally as a separate branch known as the U.S. Air Force in 1947. As the U.S. and the Soviet Union settled into the Cold War, the Air Force took the lead in developing increasingly sophisticated weapons platforms, merely hinted at during World War II, which exponentially increased the capabilities of national defense. This resulted in both spectacular achievements as well as national tragedy as it evolved and grew into a truly strategic combat and defense force. The Korean War saw the full flower of jet fighter combat, aerial medical evacuations and aerial resupply, while the Vietnam conflict featured close air support, dogfights with air-to-air missiles, search and rescue, and massive multi-year bombing operations. The Air Force took the lead in extending the nation’s defense into the “final frontier” of space, establishing early warning networks for aircraft and intercontinental ballistic missiles while developing rocketry and spacecraft technology that allowed us to land men on the moon and place satellites in orbit around the earth. Today, the Air Force continues its tradition of innovation, constantly striving to produce ever-more sophisticated platforms in both air and space to protect the nation from those who would seek to do us harm. 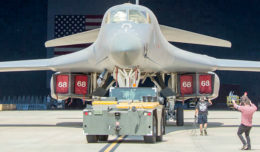 Its pilots fly jet fighters that have not lost an air-to-air engagement in over 40 years, while its bombers can penetrate anywhere in the world protected by stealth technology. Its special operations and personnel recovery teams maintain the dedication of their forebears to “leave no one behind,” “so others may live.” Its space operators execute a 24-hour/7-day a week no-fail mission, watching our adversaries the world over with increasingly sophisticated satellites and sensors to detect even a hint of hostile action and enable the destruction of their decision cycle. 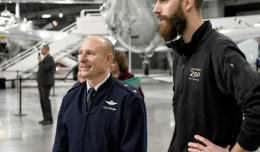 All are supported by tens of thousands of dedicated support personnel in communications, logistics, civil engineering, aircraft maintenance, security forces, medicine, finance and dozens of other functions. As the world and its threats continue to evolve, so too will the U.S. Air Force in anticipating and meeting those threats to ensure that our liberties are sustained.